With more than 40 years in the industry, Little Do’er Carpets are experts in the installation of commercial and industrial flooring in Sydney. We understand the problems that commercial and industrial buildings face and we can advise you on the best and most cost effective flooring for your needs. We have a network of commercial carpet manufacturers in Sydney and around Australia, as well as manufacturers of industrial flooring, so we are always able to locate the most suitable flooring at the best price. Office flooring in Sydney: Depending on your budget, carpet or carpet tiles, laminate, engineered, bamboo or vinyl flooring are all suitable for office spaces. The choice usually comes down to your decor and whether you need flooring for a corporate or a business office and the amount of traffic through the area. Commercial carpets in Sydney: Large commercial enterprises usually require heavy duty flooring that requires minimal maintenance. Low pile carpets are ideal for commercial buildings, as they are easily cleaned and provide insulation in noisy environments. Commercial carpet tiles in Sydney: Carpet tiles provide more flexibility than rolled carpet and can be replaced easily if they become stained or damaged. They also provide an easy way to reflect your brand and match the decor of your building. Industrial carpet in Sydney: Heavy duty carpets are ideal for heavy traffic areas, where damage or stains need to be fixed quickly. Carpet tiles are ideal for these situations and are a very cost effective option. 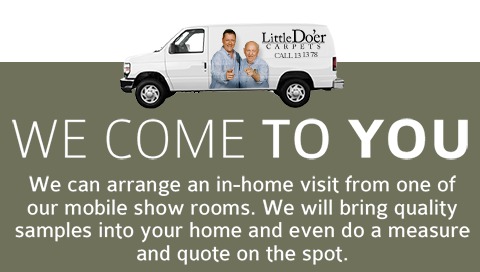 Little Do’er Carpets are experts in commercial flooring installation in Sydney and our mobile showrooms are just a phone call away. So if you are searching for a commercial carpet company in Sydney that supplies and installs high grade commercial carpets, then you can do no better than Little Do’er Carpets.